Capsicum Omelette is a healthier form of omelette prepared with beaten eggs and crunchy small pieces of capsicum (bell peppers). We don't restrict omelettes for just breakfast. 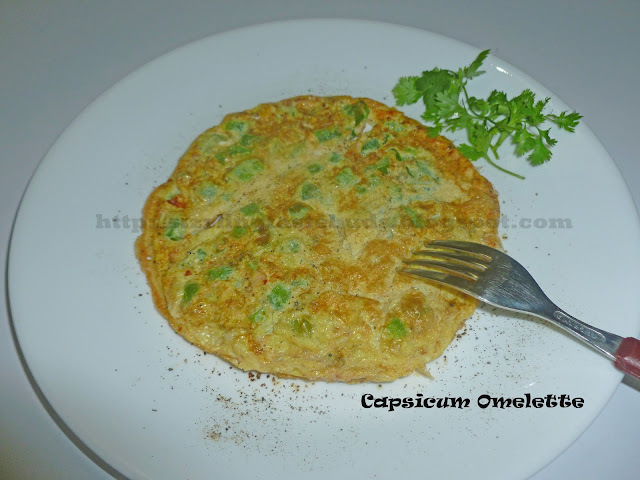 I love the crunchy bites of capsicum while having this omelette.You can add any vegetables(grated carrot, spring onions, tomatoes) you like and enjoy your favorite vegetable omelette. Drop few cheese bits to this to have a cheesy crunchy capsicum Omelette. Choice is yours! 1. Beat the eggs in a bowl and add all the ingredients one by one except oil and mix well. 2. Grease a tsp of oil in a frying pan and pour the egg mixture and cook on a lower flame. 3. Flip the omelette after 2-3 mins and cook the other side too till you get a light golden color. 4. Sprinkle more pepper powder( if needed) and serve. Note : Add few drops of milk to get more fluffy omelette.